The world is changing fast. We are at the dawn of the Fourth Industrial Revolution, which will bring together digital, biological and physical technologies in new and powerful combinations. 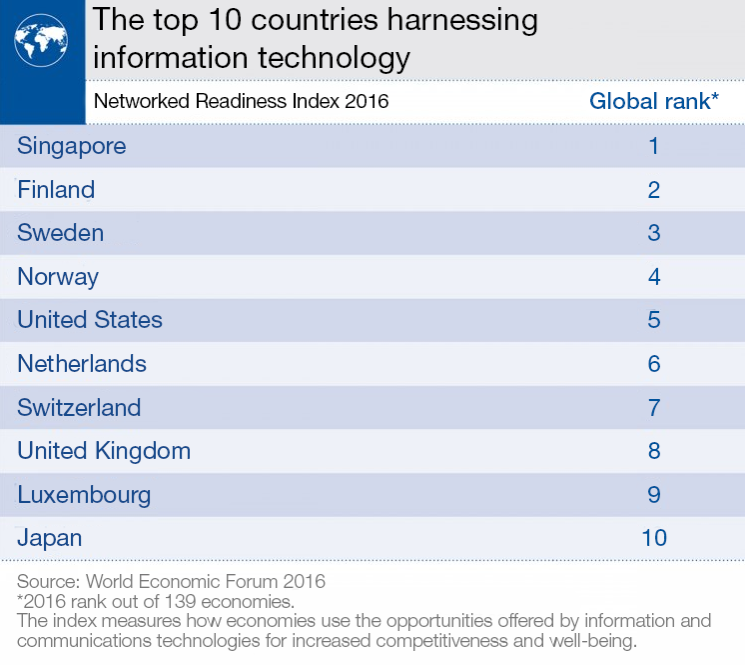 The World Economic Forum’s Networked Readiness Index is a key indicator of how countries are doing in the digital world. It measures how well an economy is using information and communications technologies to boost competitiveness and well-being. These are the 10 countries that the 2016 Index found to be best placed to make the most of the new world. Singapore is at number one. 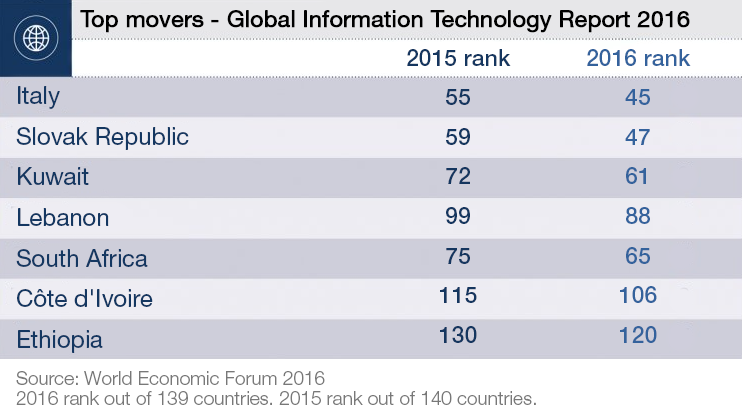 The ranking is, to a large extent, the result of strong government commitment to the digital agenda. Gains from information technology are widely shared in Singapore, and it makes excellent use of digital technologies to provide access to basic and government services, and ensure that schools are connected. Finland ranks at number two. The country has extremely good access to the latest technologies as well as venture capital, and its businesses are highly connected. Norway moves up to fourth place ahead of the United States, which has also risen this year. The US stands out in terms of its extremely favourable business and innovation environment, which has led to one of the most agile and digitized business sectors in the world. The United Kingdom stays at number eight. Perceived venture capital availability and UK government procurement of advanced technologies have improved in the last 12 months. The index shows that some countries have made significant improvements on last year's ranking. Italy has risen 10 places, the Slovak Republic 12 and Kuwait 11. Government support is important when it comes to an economy becoming networked ready. 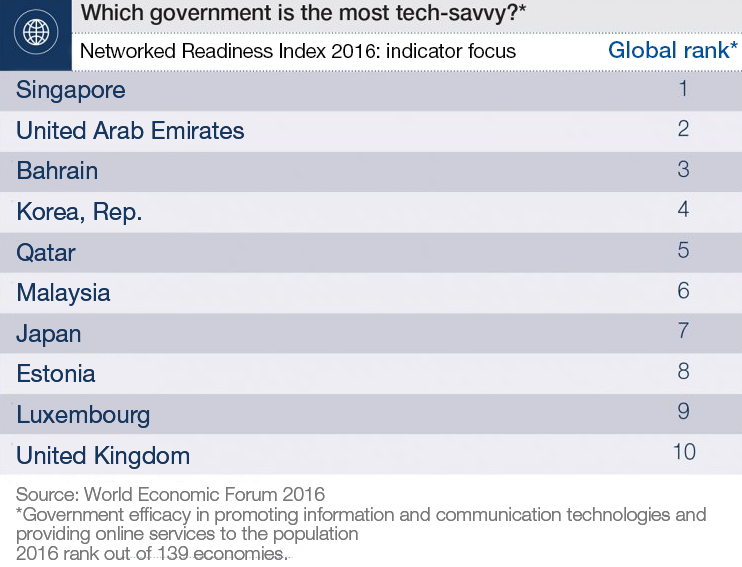 When governments were ranked according to their tech-savviness, Singapore again came out top. There are two other Asian countries in the top 10: South Korea and Malaysia. Three Arab nations feature: the United Arab Emirates, Bahrain and Qatar. The European Union is represented by Estonia, Luxembourg and the UK, while the United States government does not appear anywhere in the top 10.